I’ve wanted to put a basic crochet lovey blanket pattern on the blog forever. 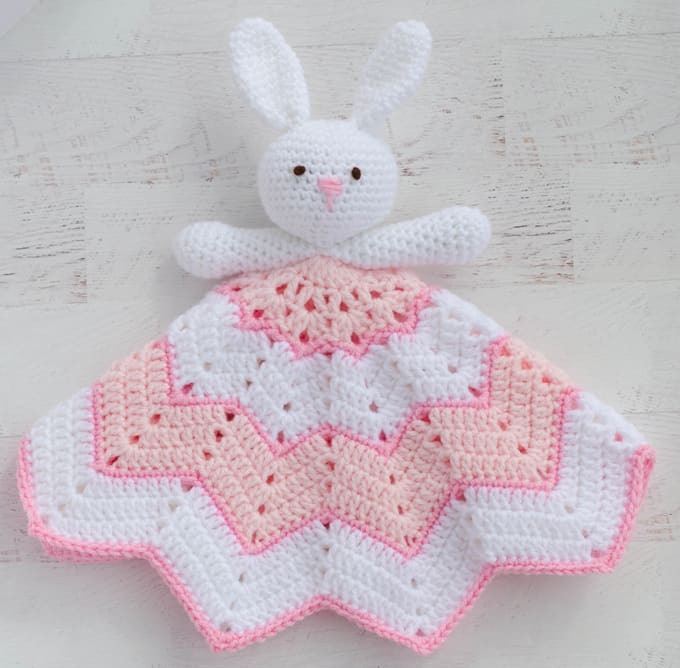 At first glance, this guy is a cute bunny lovey just perfect for Easter. But this pattern is REALLY a gateway to creativity. 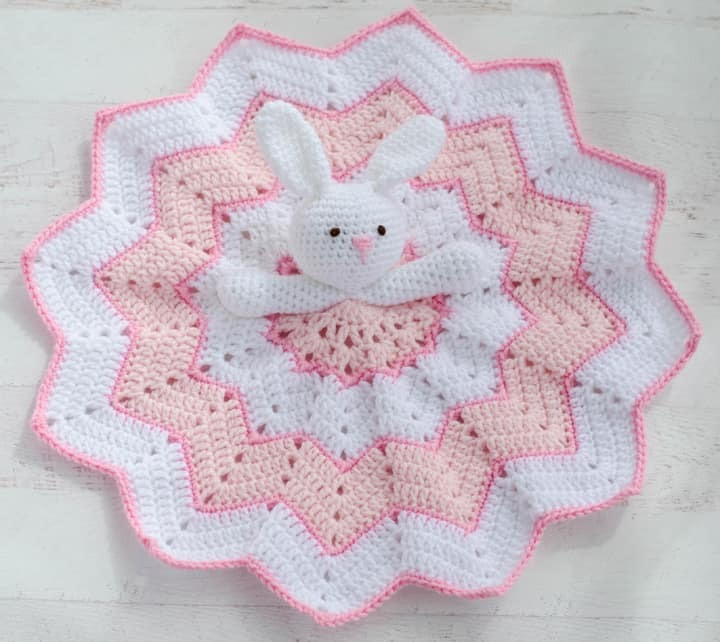 It’s meant to be a springboard for all your crochet lovey creations! 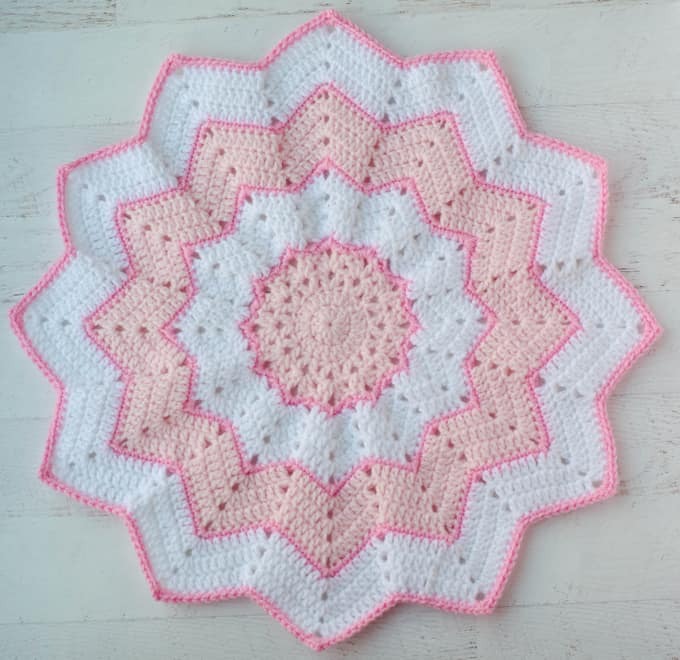 Let’s get started with this adorable crochet lovey blanket! 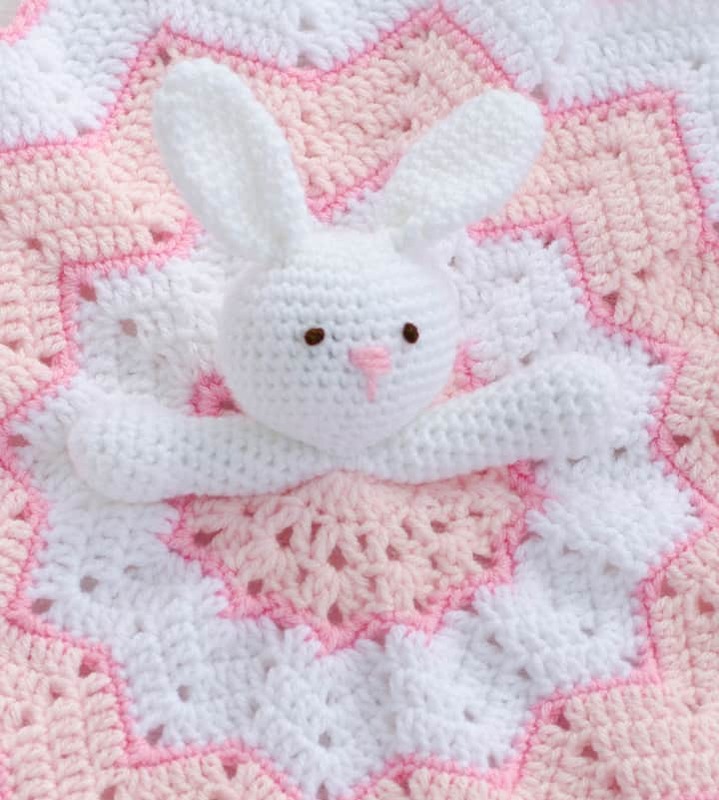 Purchase an ad-free printable version of the Sweet Bunny Crochet Lovey Blanket pattern here! Crochet Lovey Blanket shown measures about 13-1/2” when folded (excluding ears). Blanket is approximately 20” across at widest point. R3: Ch 3, *skip next st (1 dc, ch 2, 1 dc) in next st, repeat from * around. End row with a dc in base of ch 3, ch 2, join with sl st to top of ch 3. R4: Sl st into ch 2 sp, ch 3 (1 dc, ch 2, 2 dc) in ch 2 sp, *(2 dc, ch 2, 2dc) in next ch 2 sp, repeat from * around. Join. Fasten off light pink. R5: Attach dark pink to next ch 2 sp. *(2sc, ch 2, 2 sc) in ch 2 sp, 1 sc in next st, skip next 2 st, 1 sc in next st, repeat from * around, end w/sc. Join. Fasten off dark pink. R6: With white, join w/sl st in next ch 2 sp, ch 3 (1dc, ch 2, 2 dc) in ch 2 sp, 1dc in next 2 st, skip 2 st, 1 dc in next 2 st, *(2dc, ch 2, 2 dc) in ch 2 sp, 1dc in next 2 st, skip 2 st, 1 dc in next 2 st, repeat from * around. End w/2 dc. Join. R7: Ch 3, dc in next dc, *(1 dc, ch 2, 1 dc) in ch 2 sp, dc in next 3 st, skip 2 st, dc in next 3 st, repeat from *, end with dc in last st and join. R10: With light pink, join w/sl st in st before a ch 2 sp, ch 3 (counts as dc), *(1dc, ch 2, 1 dc) in ch 2 sp, 1dc in next 5 st, skip 2 st, 1 dc in next 5 st, repeat from * around. End by dc in last 4 st, join. R11: Ch 3, dc in next dc, *(2 dc, ch 2, 2dc) in ch 2 sp, dc in next 5 st, skip 2 dc, dc in next 5 st, repeat from * around and end by dc in last 3 st & join. R12: Ch 3, dc in next dc 3 st, *(2 dc, ch 2, 2dc) in ch 2 sp, dc in next 6 st, skip 2 st, dc in next 6 st, repeat from * around and end by dc in last 2 st & join. Fasten off light pink. R13: Join dark pink in ch 2 sp, ch1, *(sc, ch 2, sc) in ch 2 sp, sc in next 7 st, skip 2 st, sc in next 7 st, repeat from * around. Join. Fasten off dark pink. R14: Join white in sc before a ch 2 sp, ch 3, *(2 dc, ch 2, 2dc) in ch 2 sp, dc in next 7 st, skip 2 sc, dc in next 7 st, repeat from * around. End row by dc in last 6 st & join. R15: Ch 3, dc in next 2 dc, *(2 dc, ch 2, 2dc) in ch 2 sp, dc in next 8 st, skip 2 st, dc in next 8 st, repeat from * around. End row by dc in last 5 st & join. R16: Ch 3, dc in next 4 dc, *(dc, ch 2, dc) in ch 2 sp, dc in next 9 st, skip 2 st, dc in next 9 st, repeat from * around. End row by dc in last 5 st & join. Fasten off white. R1: With white, ch 2, 6 sc in 2nd chain from hook. (6 st) Work in rounds. R17: *sc in next 2 st, sc next 2 st together. Repeat from * around (18) Stuff. R19: *sc next 2 st together. Repeat from * around (6 st). Fasten off, leaving a long strand for finishing. Weave through last 6 stitches, pull tight, weaving in ends or knotting of to secure. R14: sc around (9 st). Fasten off, leaving a long strand for sewing. R7: *sc in next st, sc next 2 st together. Repeat from * around. (10 st). R8-17: sc around (10 st). Sl st to next sc and fasten off leaving a long strand for finishing. Stuff firmly, leaving the top ½” unstuffed. For nose, find approximate center of head. Using pink yarn, stitch over 2 stitches several times to form nose (mine covers 1-1/2 rows starting with row 10). Before fastening off, make one stitch downward from the bottom of the nose, covering 2 stitches. Use dark brown yarn to make 2 french knots for eyes above the nose. There are approximately 5 stitches between the eyes. Fold bottom of each ear together in half and sew together, then sew on to head between rows 3 & 4 or wherever it looks pleasing to you. Position arms so that tops of arms touch in center of blanket to form a straight line to opposing points on the blanket, referring to photo below. Sew arms down where they join (shoulder/armpit area) to the blanket, leaving the rest of the arms free. Sew head on top of arms. Sew through arms and blanket to secure. 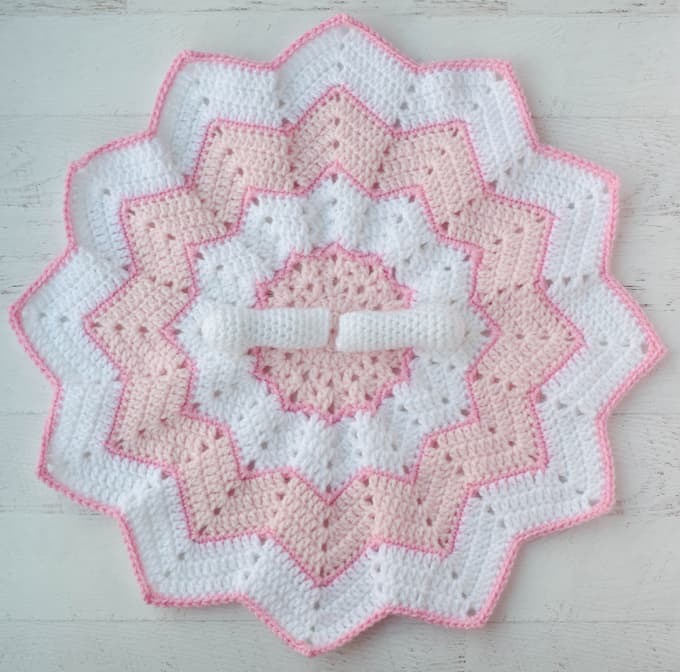 Looking for more Baby patterns? 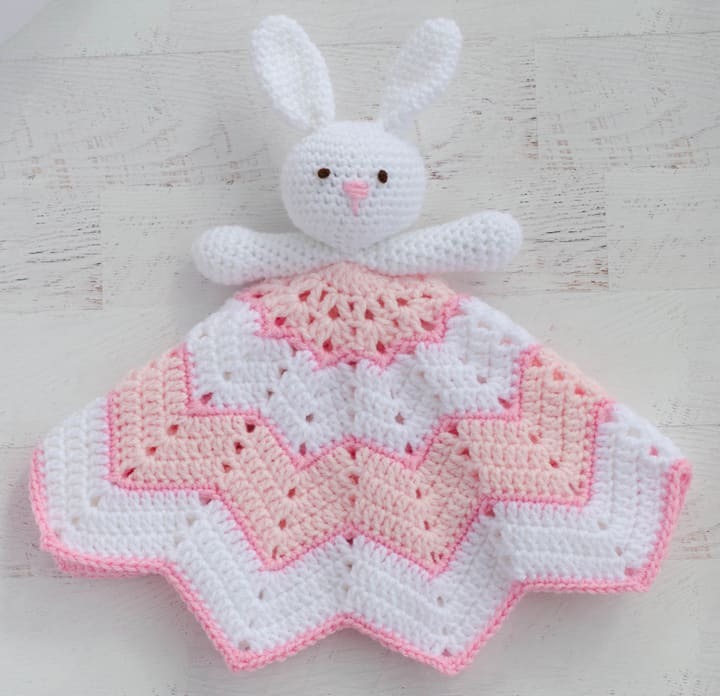 Click here for more Baby patterns! 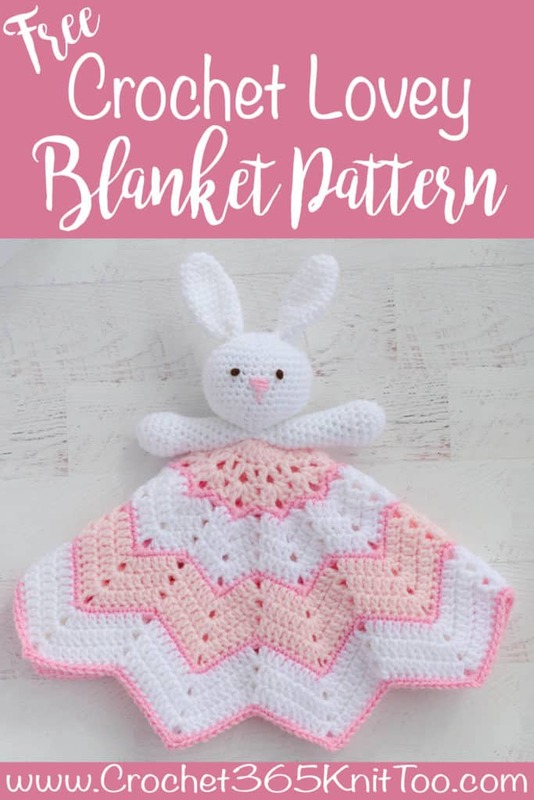 Purchase an ad-free printable version of the Crochet Lovey Blanketpattern here! I love seeing your finished projects! If you enjoyed making the Crochet Lovey Blanket, I’d love to see yours on Instagram, be sure to tag me @crochet365knittoo. If you are on Facebook, stop over to the Crochet 365 Knit Too Facebook page or pop over to the Crochet365KnitToo Club and share a photo! I’d love to see your work!